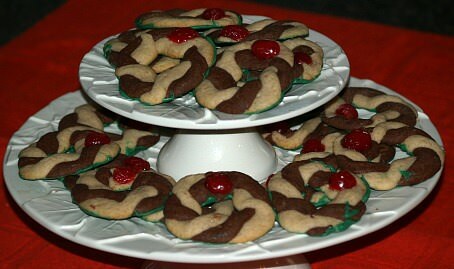 It is so amazing how many people want to know how to make Christmas wreath cookie recipes. Since I was very young I made cut out Christmas cookies. 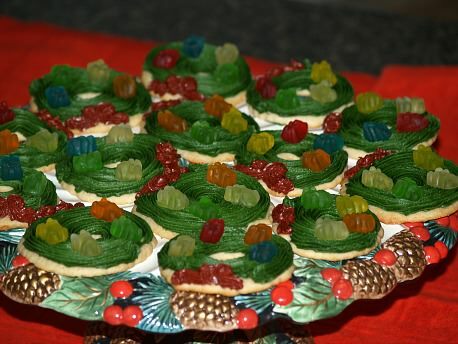 Among these were always some wreath cookies decorated with green frosting and usually little red cinnamon candies for the berries. I never thought about expanding my collection of different types of wreaths until I found that this is what many want. As I began learning how to make Christmas wreath cookie recipes I was thinking just what is it that makes wreaths special? The only thing I knew was that way back when I was a child when Dad brought in our Christmas tree, he had a wreath also. I noticed that later in my life, many women I knew would keep a wreath on their door all year round to match different seasons. Unlike Christmas wreath cookie recipes, door wreaths can be made of almost anything. Over the years I have had wreaths made of cookies and candies which I would hang inside for different holiday seasons. The most popular outside Christmas wreaths are made with cuttings from pine and other evergreen trees. For decorations, pine cones and wild berries are usually used. For me, a wreath on the front door was a symbol of hospitality or a “welcoming” to anyone visiting. I always get a “warm” feeling when approaching a door with a pretty wreath facing me. I never really thought about it but wreath designs are used for hairdressing, in making jewelry as well as cookies, breads and other baked goods. 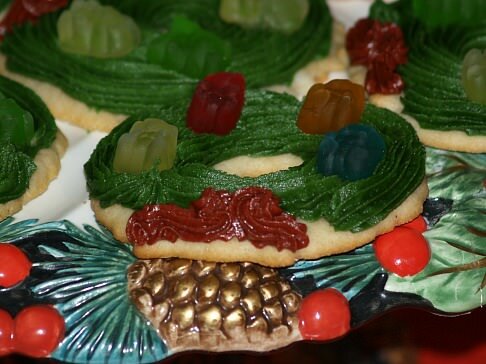 If you want to learn how to make Christmas wreath cookie recipes, you should know that this design dates back thousands of years to Greek mythology. The “wreath” was a symbol of excellence or accomplishment. The original laurel wreath can now be found created with flowers, fruits, and leaves or anything imaginable. The circular wreath, having no beginning and no end, in Christianity symbolizes eternal life through Jesus Christ. This is called an “Advent wreath” and is first associated with the Germans. I suppose this is why my family always had an evergreen wreath for the holiday season. Whatever the story behind the wreath, I love them especially at Christmas. 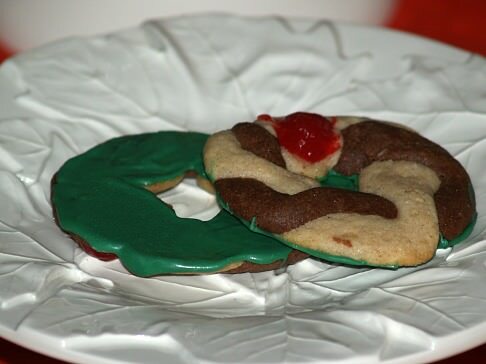 My family always enjoys special Christmas wreath cookie recipes. 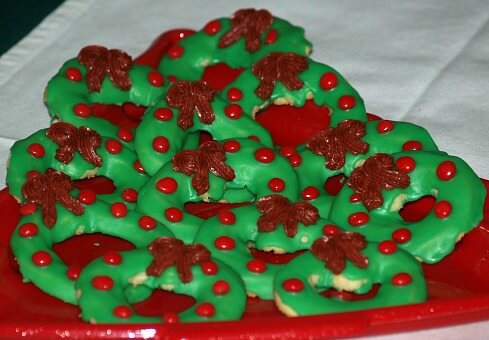 This Christmas wreath cookie recipe is very soft and made with 12 mini dough balls. Combine all ingredients until well blended; roll into tiny balls. NOTE: I use ¼ to ½ inch balls; 12 balls for each wreath. Bake 12 to 15 minutes until bottom edges start to brown; cool completely. These cute Christmas wreath cookie recipe is easy to decorate. Cream butter and sugar with mixer in large bowl; beat in egg. Stir in flour, baking powder, salt and cinnamon until well blended. Shape dough into ball and wrap in plastic wrap; refrigerate about 2 hours. Roll part of the dough at a time to ¼ inch thickness on lightly floured surface. Cut with wreath cookie cutter; place on ungreased cookie sheets. Bake about 9 minutes until edges start to turn brown; move to rack and cool completely. NOTE: These are cute when frosted and decorated with gummi bears candies. 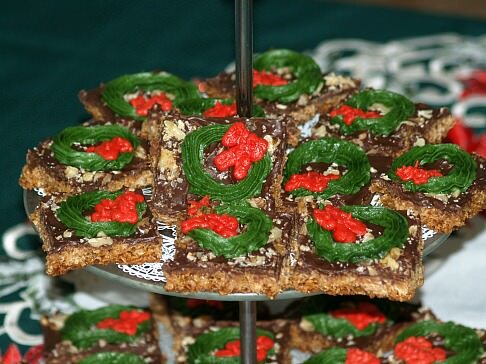 Add this recipe to your Christmas wreath cookie recipes. Cut dough into holly leaves. After baking and cooling, frost the holly cookies with green frosting and place together to form a large wreath for presentation. Decorate with red bow and red candied cherries. In a large bowl combine flour, baking powder, baking soda and salt; cut in butter until crumbly. In small bowl beat the eggs; gradually add in sugar, vanilla and lemon beating until light. Add egg mixture to the flour mixture stirring by hand until well blended. Combine dough into a ball, wrap with plastic wrap and refrigerate 1 hour. Roll half of dough at a time to 1/8 inch thickness on lightly floured surface. 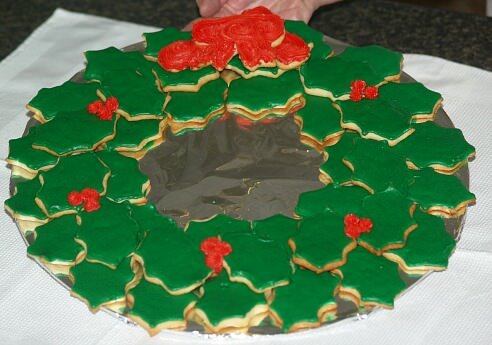 Cut holly leaves with 2 to 2 ½ inch cookie cutter; place baking sheet lined with parchment paper. Bake 6 to 9 minutes until edges are light brown; remove from sheets and cool completely. 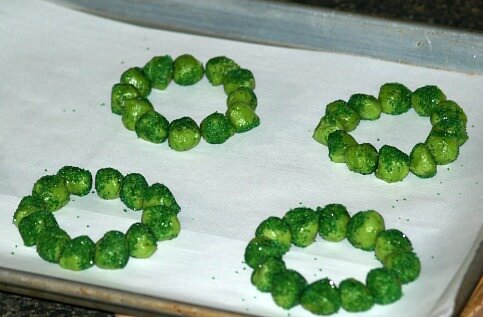 Frost each leave with green icing and place on round tray to shape a wreath. Decorate with red bow and red berries. IN SMALL BOWL combine sugar, butter, vanilla and green food coloring. Add enough milk if needed for spreading consistency. 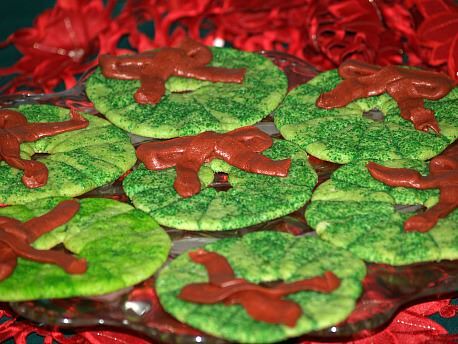 These spritz Christmas wreath cookie recipes are simple to make. Combine butter and sugar and beat until fluffy; beat in egg, vanilla and almond. On low speed of mixer blend in flour until well mixed. If desired add food coloring a little coloring until bright green. Spoon 1 cup of dough into cookie press or pastry bag fitted with large star tip. Press dough in 2 inch wreath shapes 1 inch apart on ungreased baking sheets. Decorate with red candies; bake 5 to 6 minutes until bottoms are barely browned. 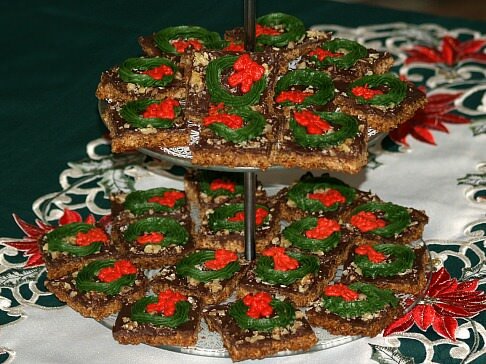 This is one of those Christmas wreath cookie recipes which almost taste like candy. These squares are thin and crunchy, much like the chocolate covered toffee candy. Preheat oven to 400F degrees; lightly grease 15X10 jelly roll pan. Combine oats, brown sugar, butter, corn syrup, vanilla and salt; mix well. Firmly press mixture in prepared pan; bake 18 minutes or until browned. Remove from oven and immediately sprinkle top with chocolate chips; let stand 10 minutes. Spread melted chocolate evenly over toffee; sprinkle with nuts. While warm cut into squares; cool completely and CUT AGAIN. Make wreaths on tops with frosting; makes about 6 dozen. Combine and mix thoroughly shortening, sugar, rind and eggs. Stir in flour; chill dough at least 1 hour. Break off pieces of dough; roll to 6 inches long and ¼ inch thick (Pencil size). NOTE: If dough crumbles, let it warm up a little. Bring one end of dough to other end making a circle; tie in single knot leaving ½ inch on each end. Place on ungreased baking sheets; beat egg white until frothy beating in 2 tablespoons of sugar. Brush tops of cookies with meringue; press bits of candied cherries to decorate. Bake 10 to 12 minute or until set (Not brown). In a large saucepan, melt butter and marshmallows; add vanilla and food coloring. Stir cornflakes into marshmallow mixture; mix well and drop by teaspoons onto wax paper. Using buttered fingers make a hole in the center so cookie looks like a wreath. Place red cinnamon candies on wreath to look like holly berries; let stand to firm up. NOTE: Do not store well. Combine flour, cornstarch and sugar in a bowl; blend in butter until smooth. Form dough into 2 balls; chill until firm. Roll 1 ball into a 9 inch circle on floured surface; transfer to a greased baking sheet. Cut out center of circle with a small cookie cutter; cut wreath into 12 equal wedges. NOTE: If desired scallop inside circle and outside with a cutter. Separate wedges leaving 1/8 inch between; decorate outer and inner edges with sprinkles. Repeat process with remaining dough; bake for 18 to 22 minutes or until golden brown. Cool in pan 5 minutes; recut wreath into wedges; move to rack to cool completely. To serve arrange wedges as wreath on a large flat serving plate. Makes 2 wreaths; 24 cookies. Cream butter, sugar, spices and egg yolk with mixer on medium speed until fluffy. Divide dough into 4 parts; shape each into a disk, wrap and refrigerate at least 1 ½ hours until firm. PREHEAT OVEN to 350F degrees; coat baking sheets with nonstick cooking spray. Working with 1 part of dough at a time roll between 2 sheets of wax paper 1/8 inch thickness. Gently lift top wax paper off of dough; replace wax paper. Flip dough and paper over; peel off other piece of wax paper and discard. Cut dough with a 2 ½ inch round cookie cutter; place half of the rounds ½ inch apart on cookie sheets. With a 1 ½ inch round cutter cut out centers from remaining half of rounds; place on baking sheets. NOTE: Reroll scraps and cut out equal numbers of cookies with and without holes in centers. Brush tops of “rings” with egg white and arrange a wreath of sliced almonds on rings. Bake 8 to 10 minutes until lightly browned; cool 5 minutes and remove from pan to rack to cool completely. Melt jams SEPARATELY in microwave over low heat; strain apricot jam. Spoon 1 ½ teaspoons of apricot on half of rounds; spoon raspberry on other half. Top each with almond topped rings pressing lightly; repeat with remaining dough. 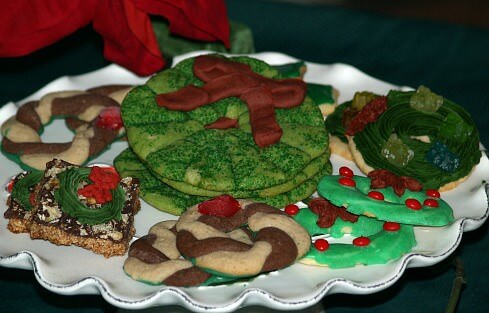 Enjoy these Christmas wreath cookie recipes during the holiday season. Cream butter and sugar on high speed until fluffy; beat in cinnamon and baking powder. Beat in egg and vanilla; beat in part of flour. Remove from mixer and stir in remaining flour. Divide dough in half and remove half from bowl; stir cocoa powder and crème de cacao into dough in bowl. Wrap each part of dough separately and refrigerate until firm about 30 minutes. Roll each half of dough into a 12 inch log on lightly floured surface; cut each into twenty four ½ inch pieces. Roll each piece into a 6 inch rope; place a dark rope and a light rope “side by side” and twist together 5-6 times. Shape twisted rope into a circle gently pinching where ends meet; place 2 inches apart on ungreased baking sheet. Place a cherry half over the “pinched” spot; bake 8 to 10 minutes until edges are firm and lightly browned. Cool 1 minute; remove from pan to rack and cool completely. Decorate with frosting or chocolate if desired. NOTE: Sometimes I spread Wilton’s green tinted melted chocolate over the backs. Turn cookies over on rack, spread with melted chocolate and let stand until chocolate is firm and then turn over.